Stata's generalized structural equations model (SEM) command now makes it easy to fit models on data comprising groups. If you are new to Stata and gsem, let us tell you that this is just one new feature in a command that already has many features gsem fits confirmatory factor models, seemingly unrelated models, SEMs, multilevel models, and all combinations thereof. It fits these models with outcomes that are continuous, binary, ordinal, count, and even survival. With the new group() option, we can estimate distinct parameters across groups for any of these models. We can even combine group analysis with gsem's other new featurelatent class analyses. But then you could not compare the fitted parameters or constrain some parameters to be equal across groups. 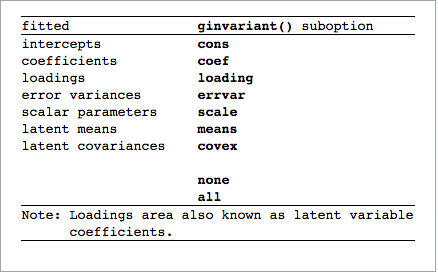 only the intercepts are constrained to be equal across groups.